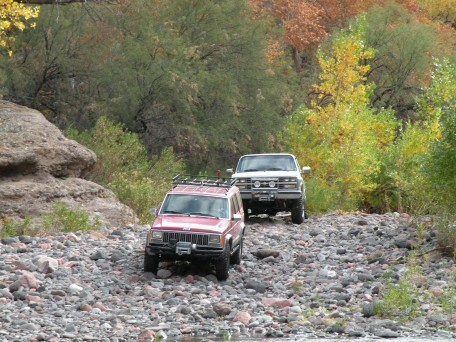 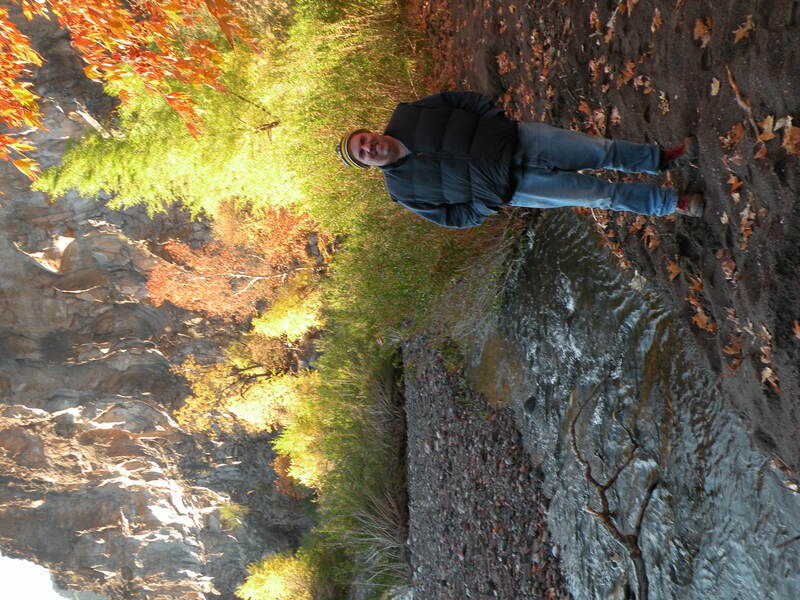 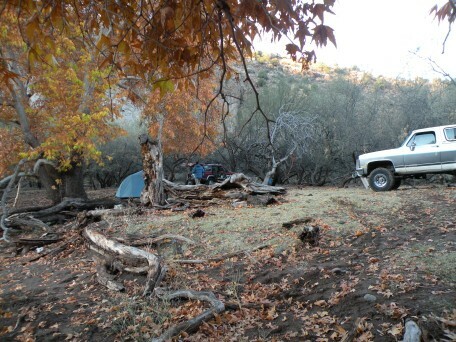 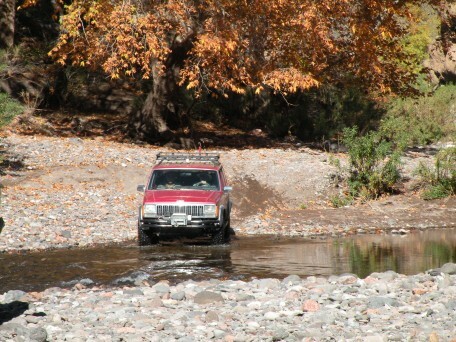 Here's our trip report from the wheelin' and campin' adventure in the upstream part of Lower Eagle Creek on 28-29 November 2008. Participants were John H. in his white Avalanche 2500, Bob P. in his fullsize Blazer, and Mike D. (planetary Mike) and Rick M. in Mike's red Cherokee. 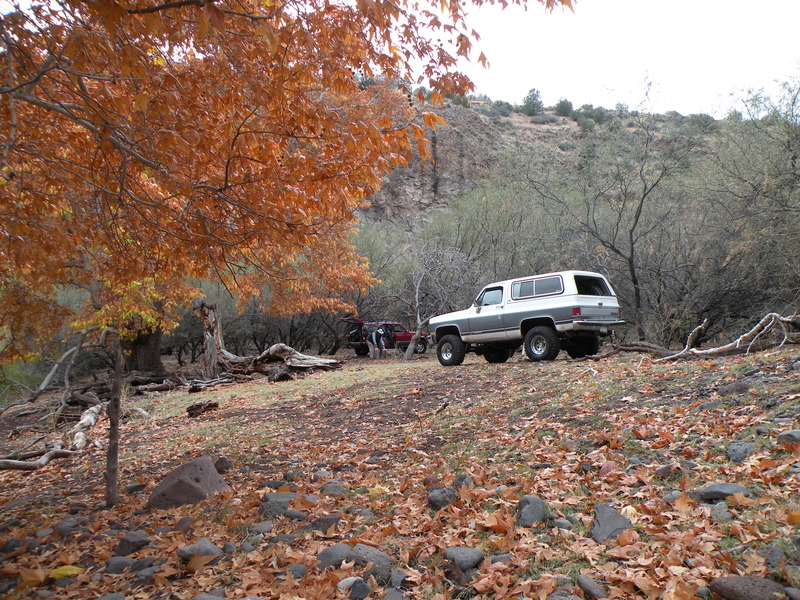 It was still spitting rain while we were gassing up and airing down at the Conoco station in Morenci at noon on Saturday. It was mostly cloudy the rest of the afternoon, but that was the last we saw of the bad weather. 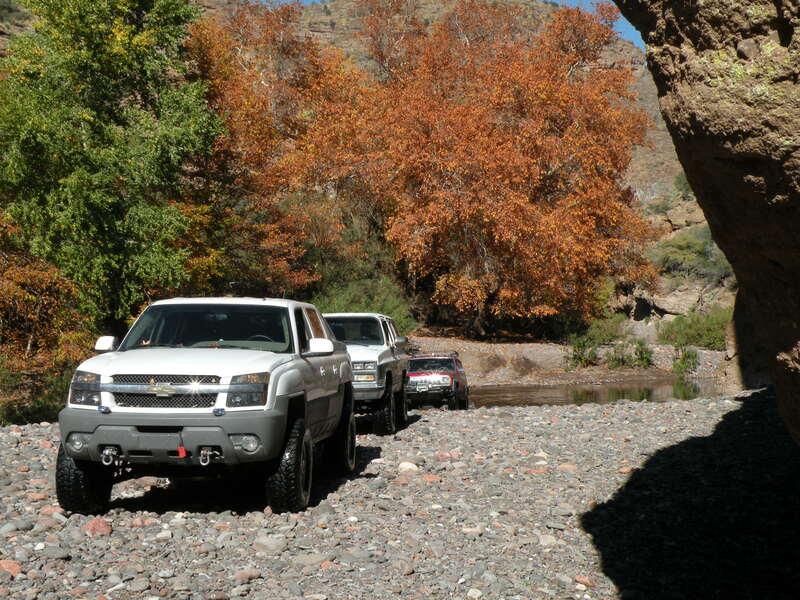 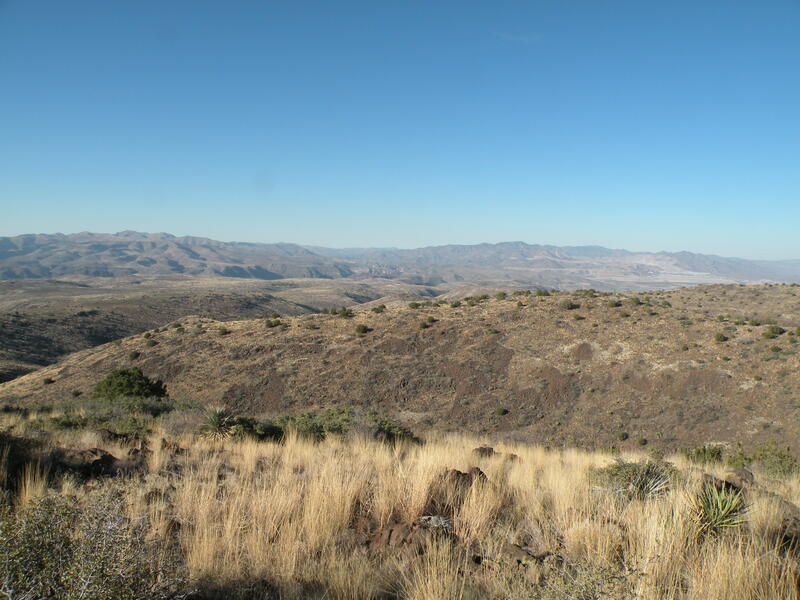 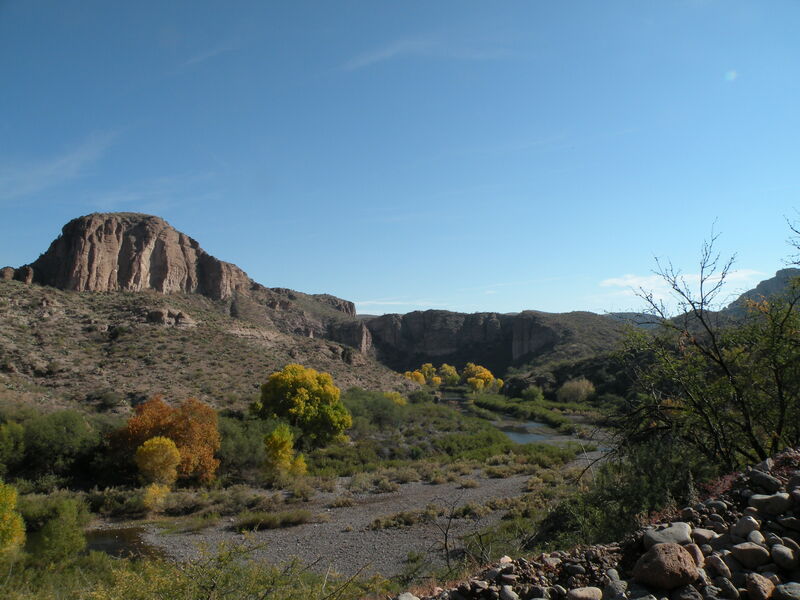 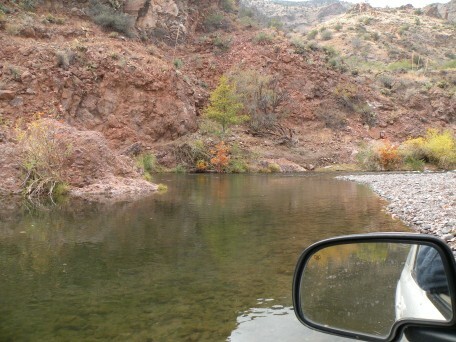 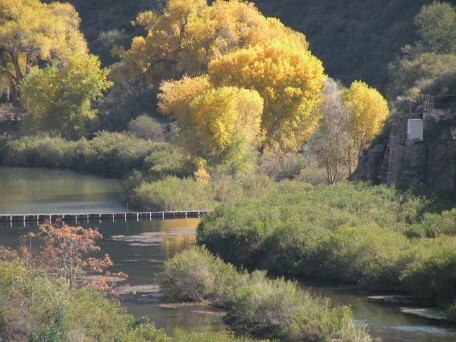 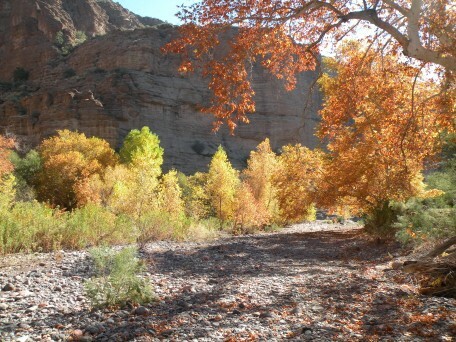 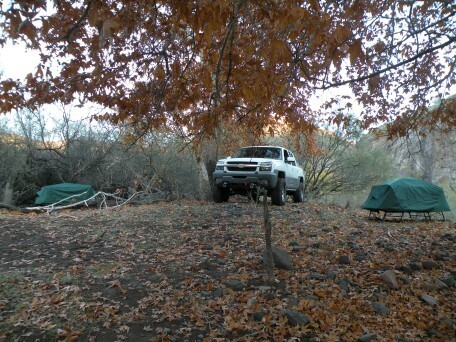 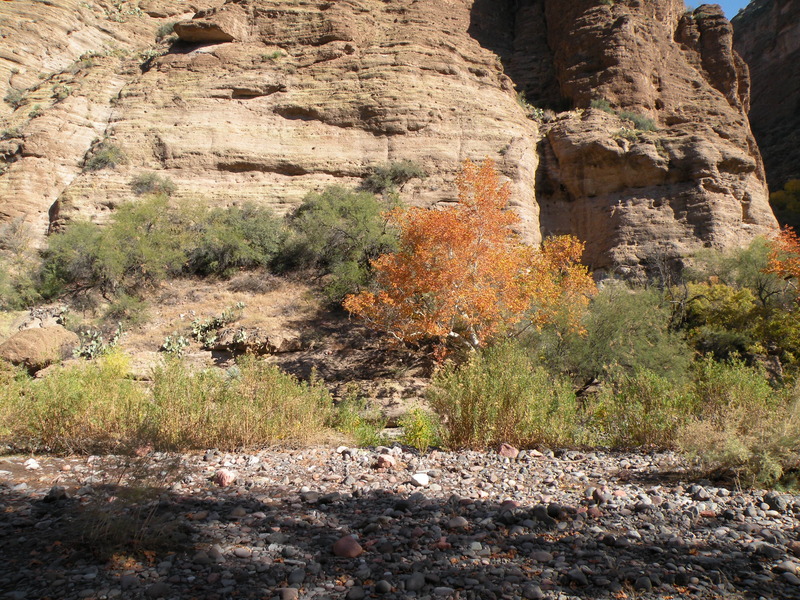 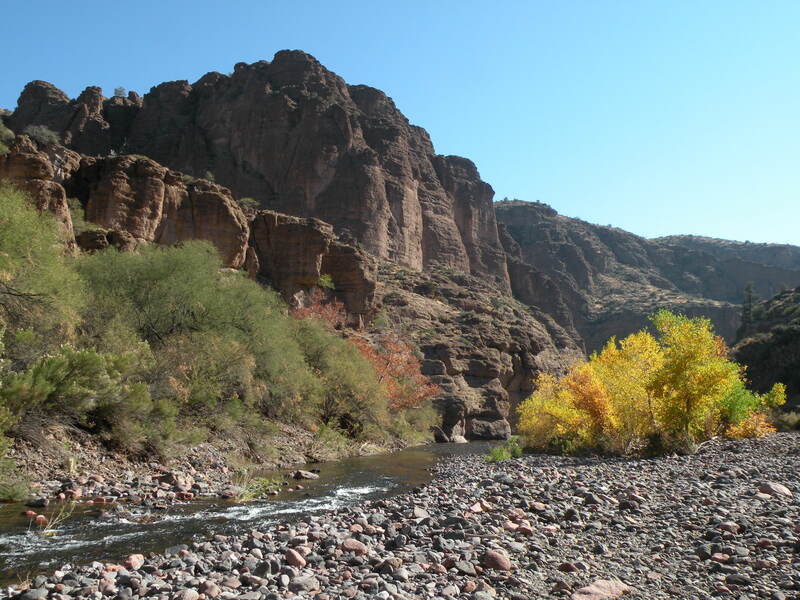 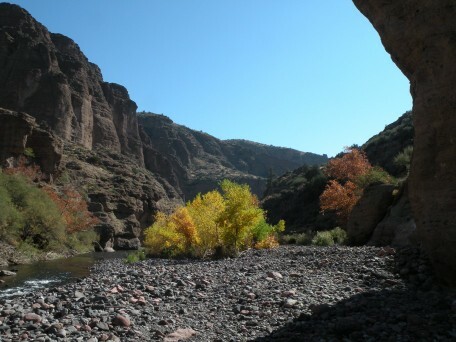 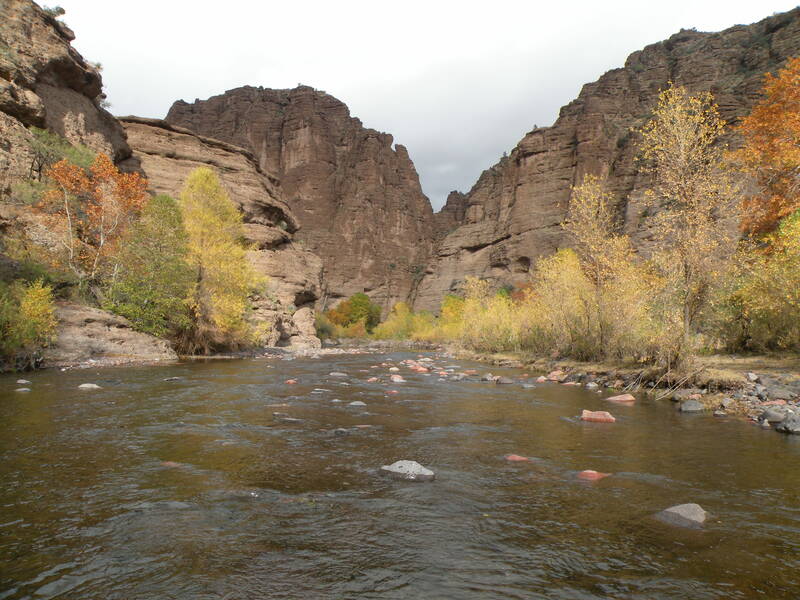 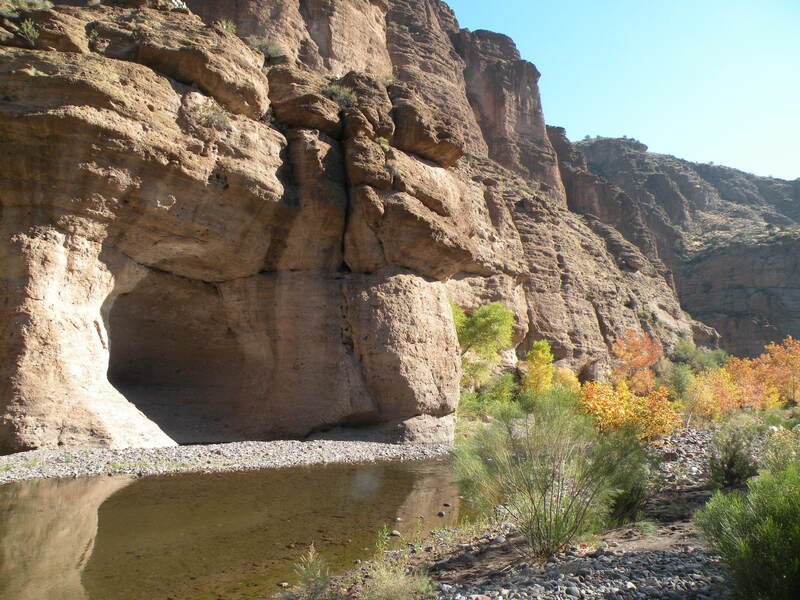 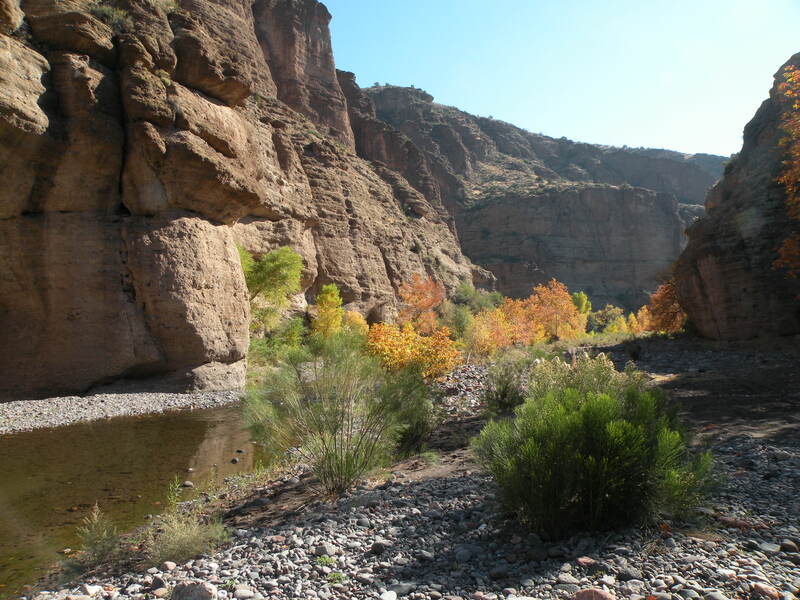 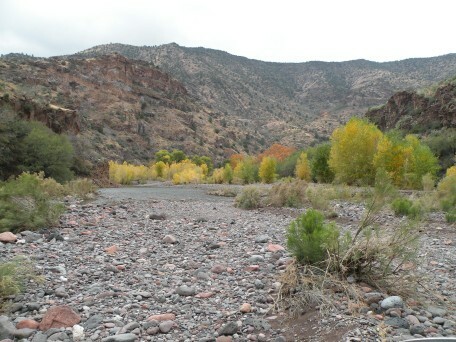 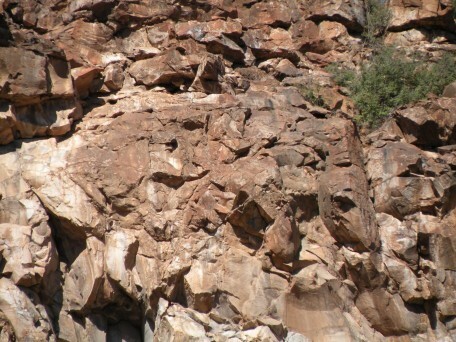 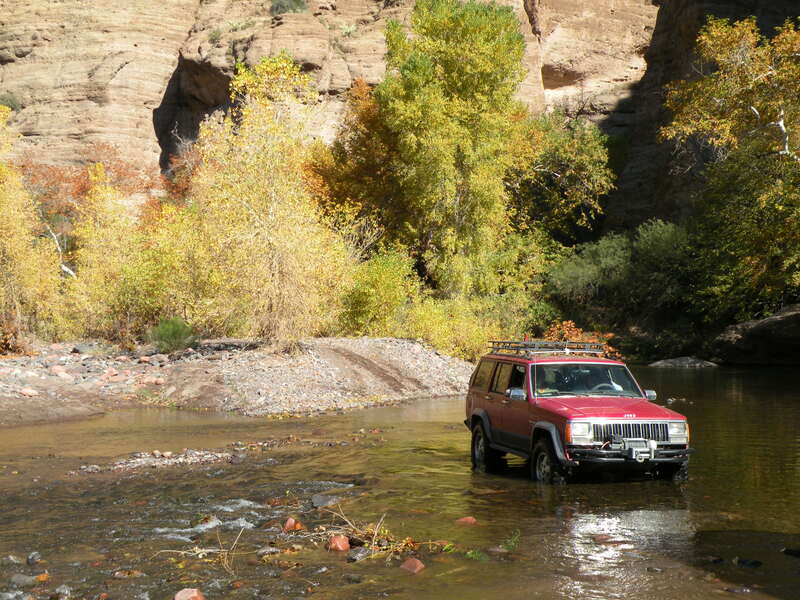 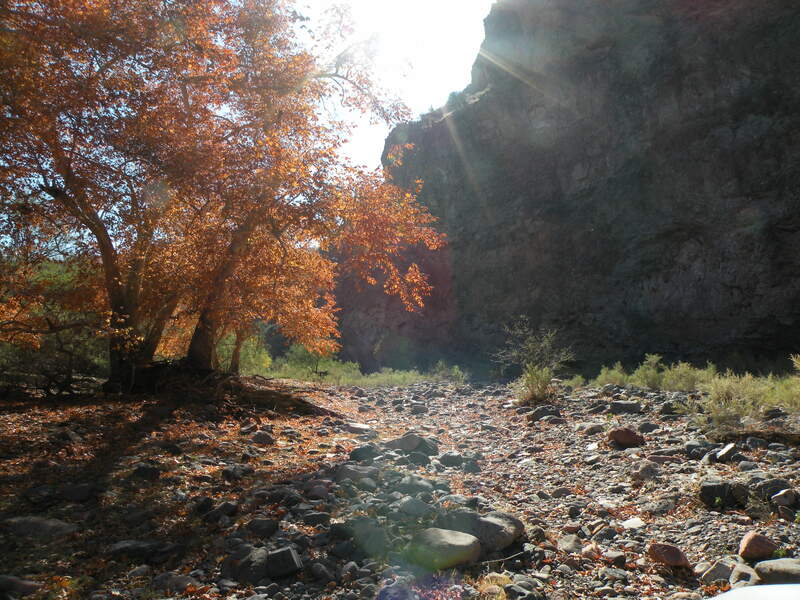 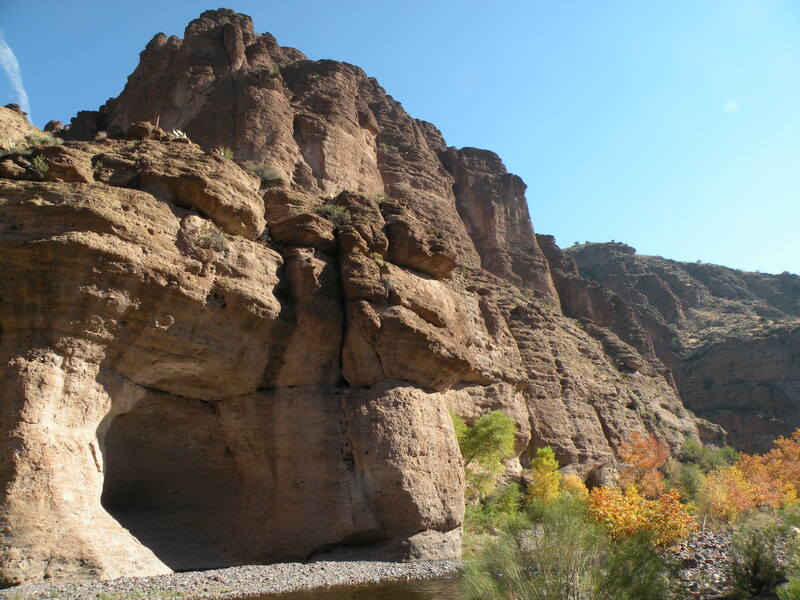 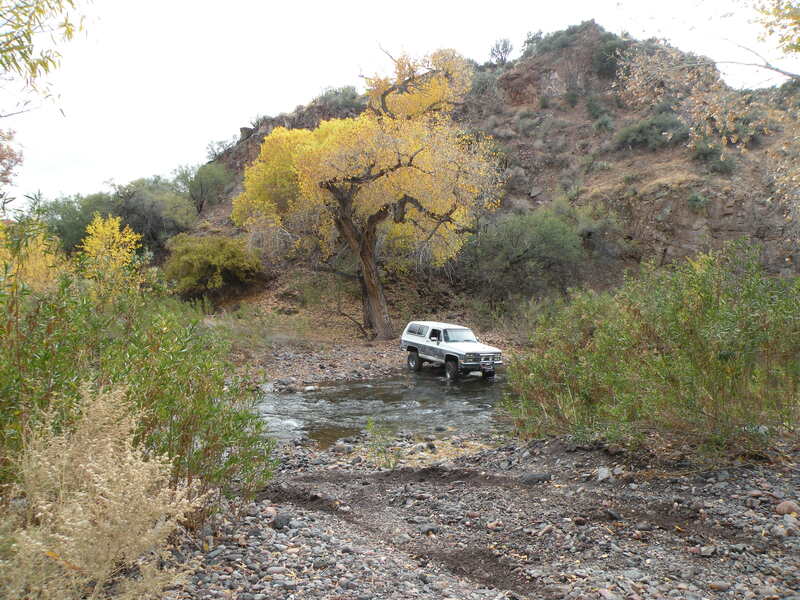 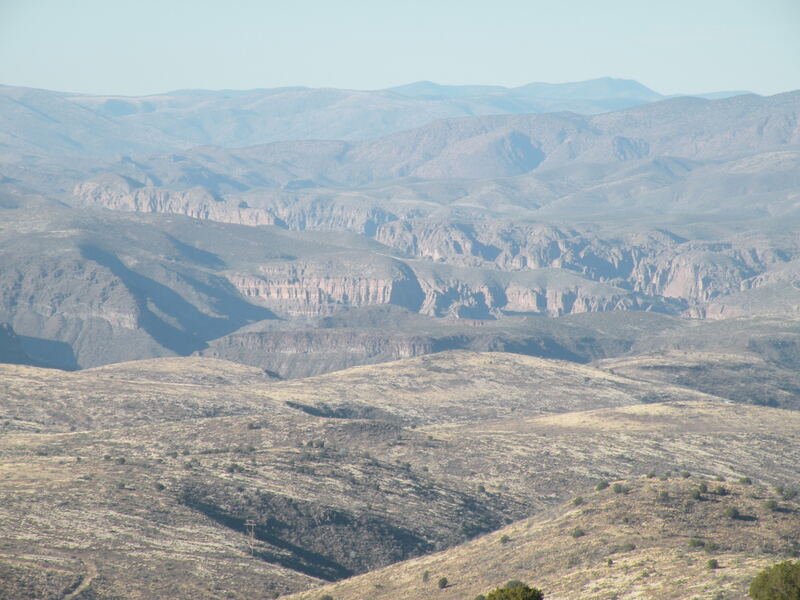 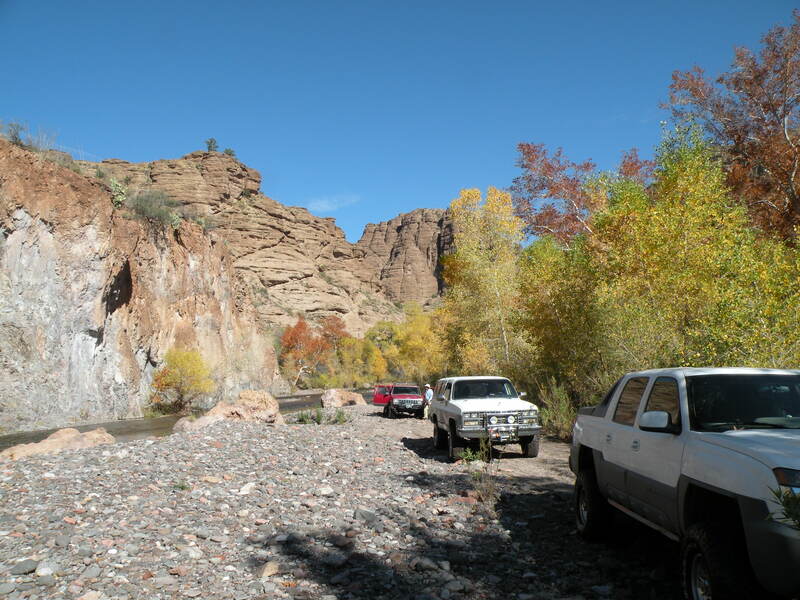 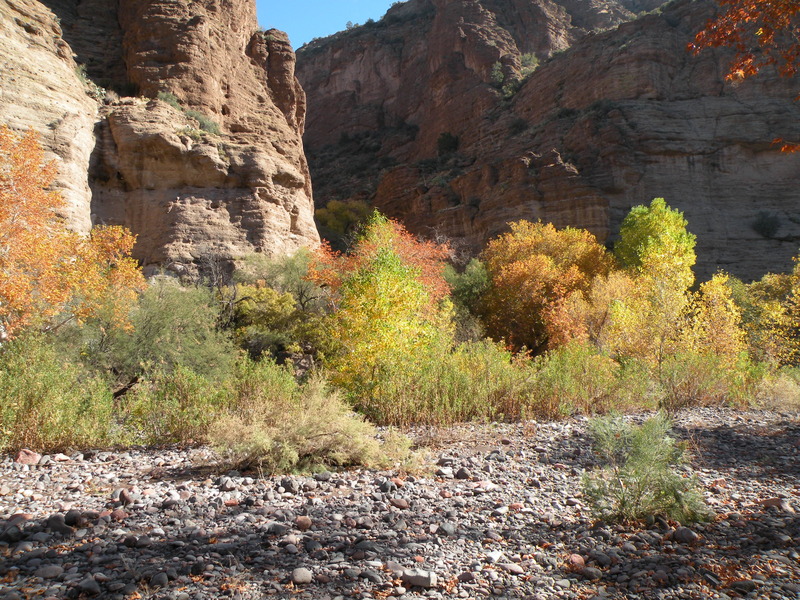 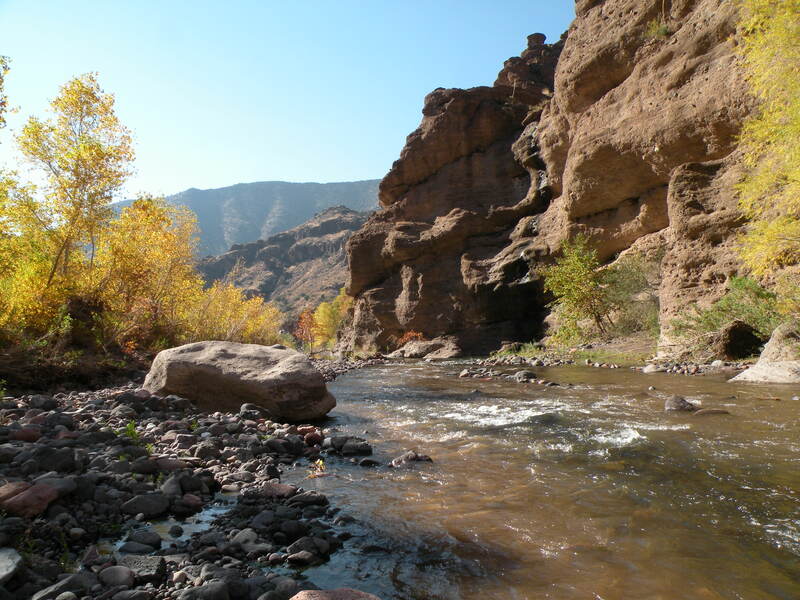 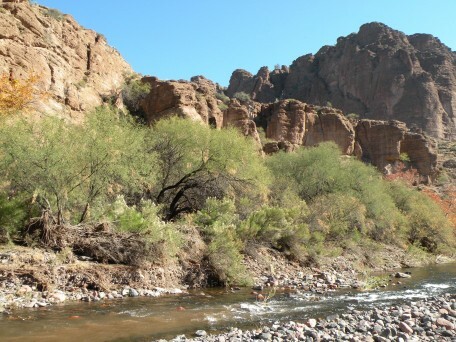 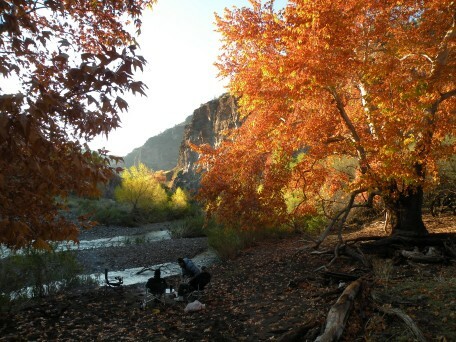 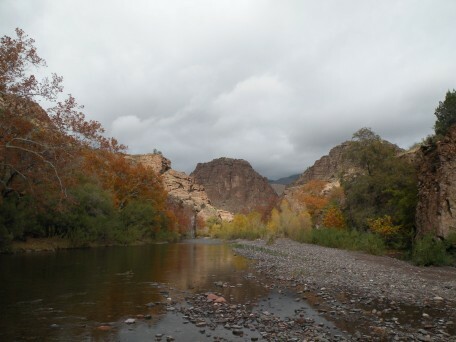 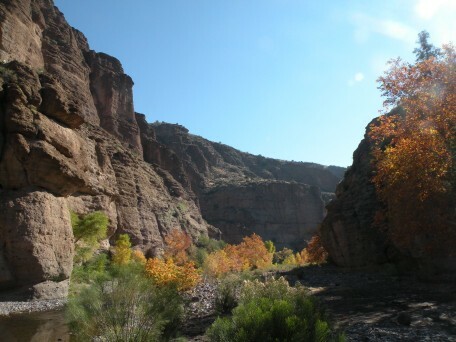 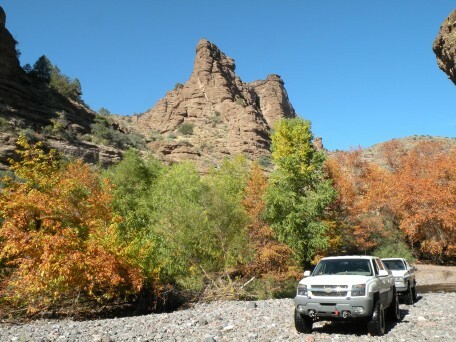 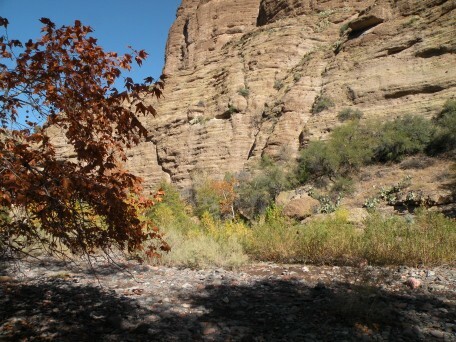 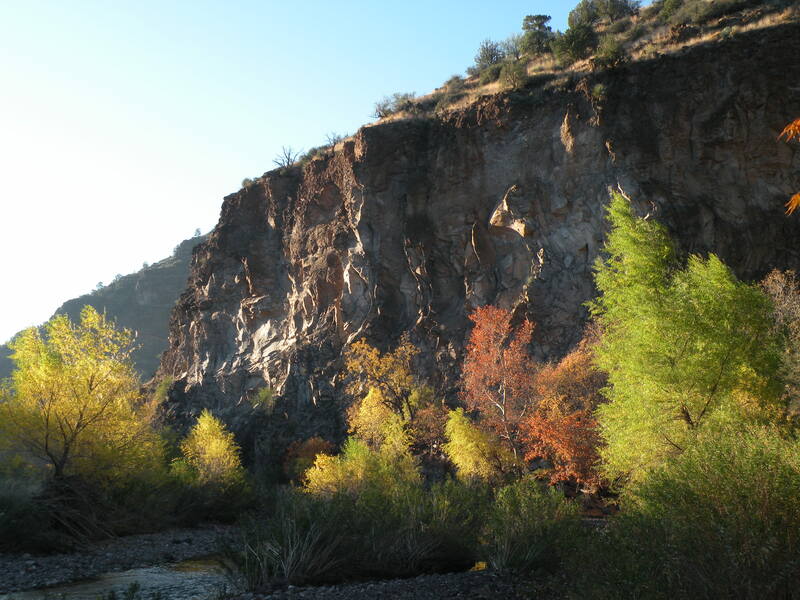 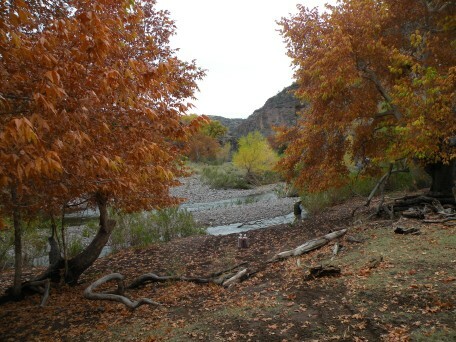 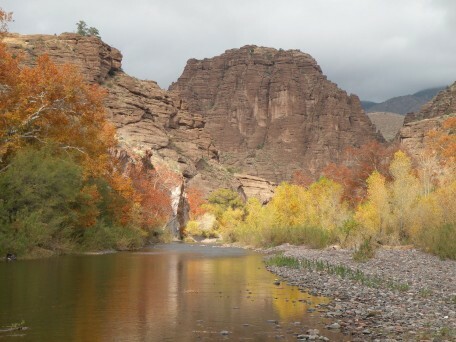 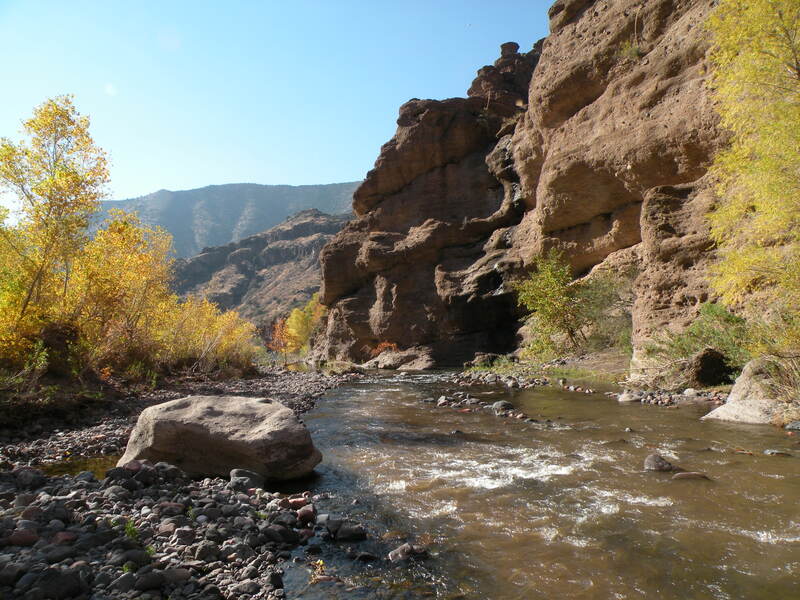 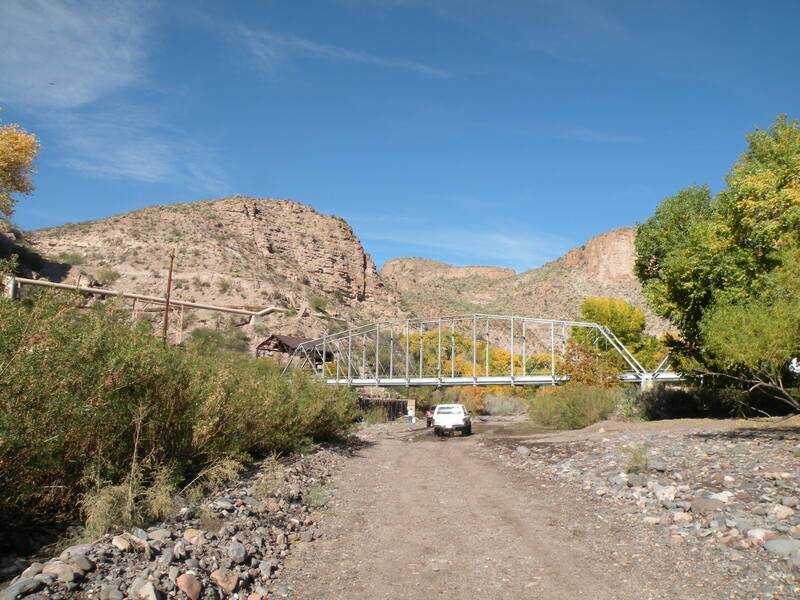 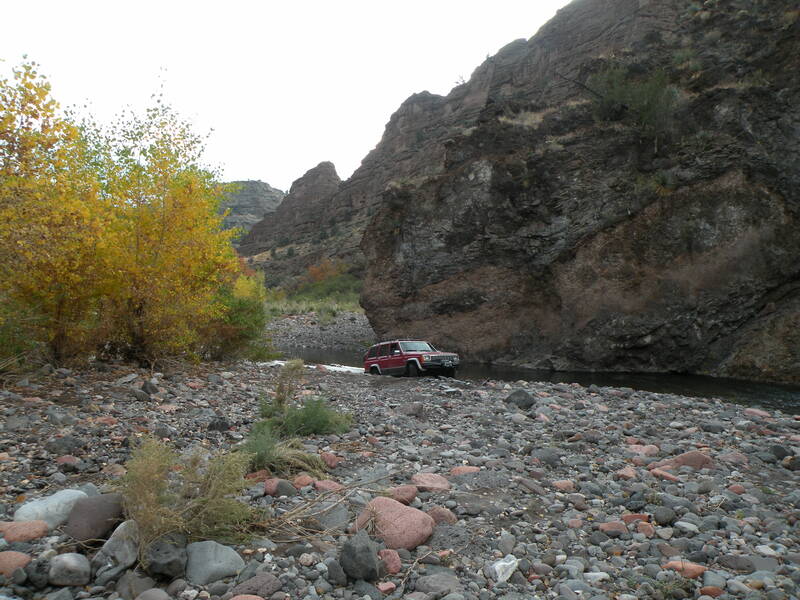 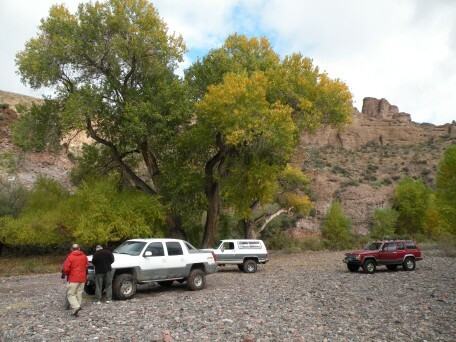 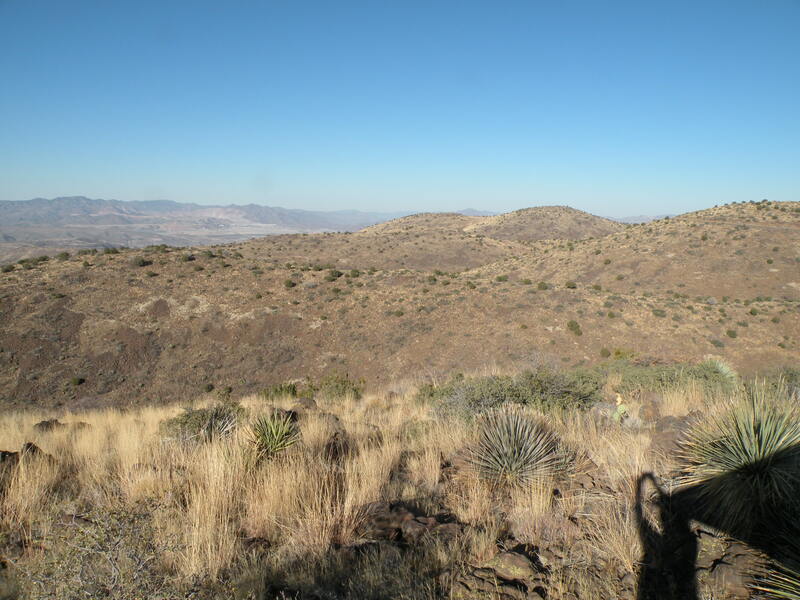 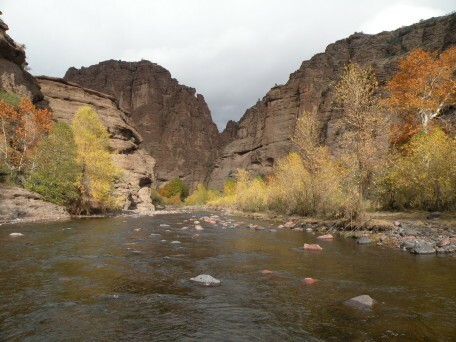 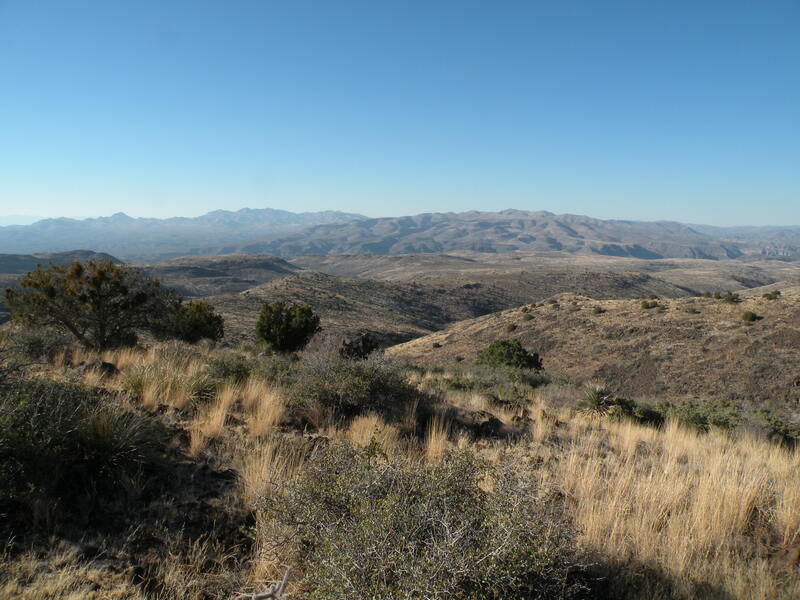 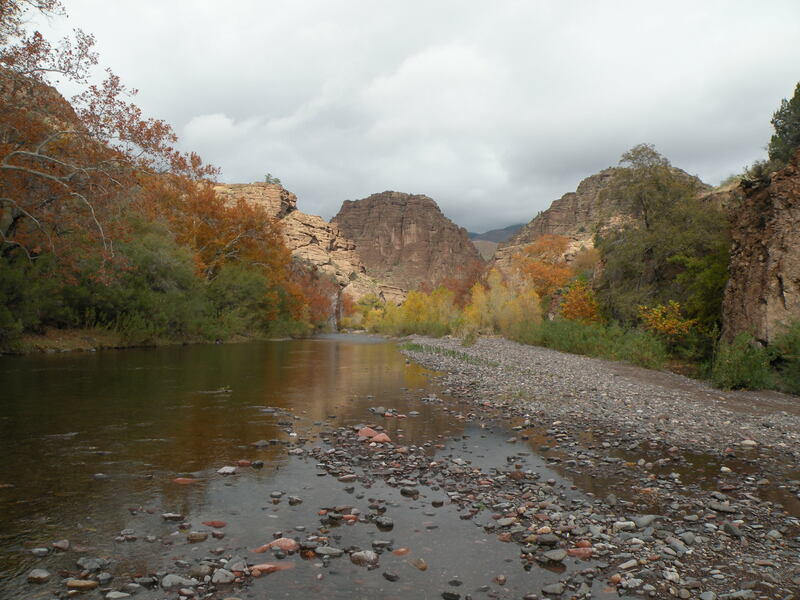 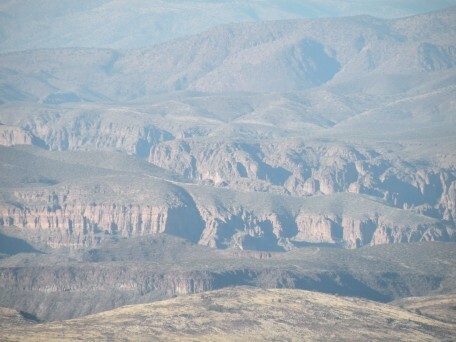 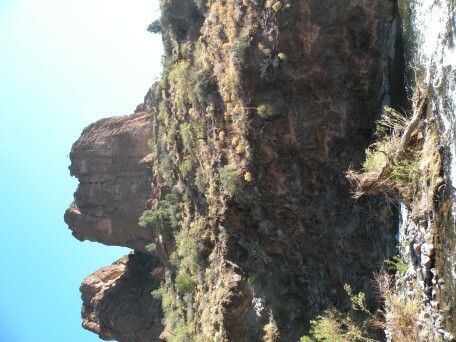 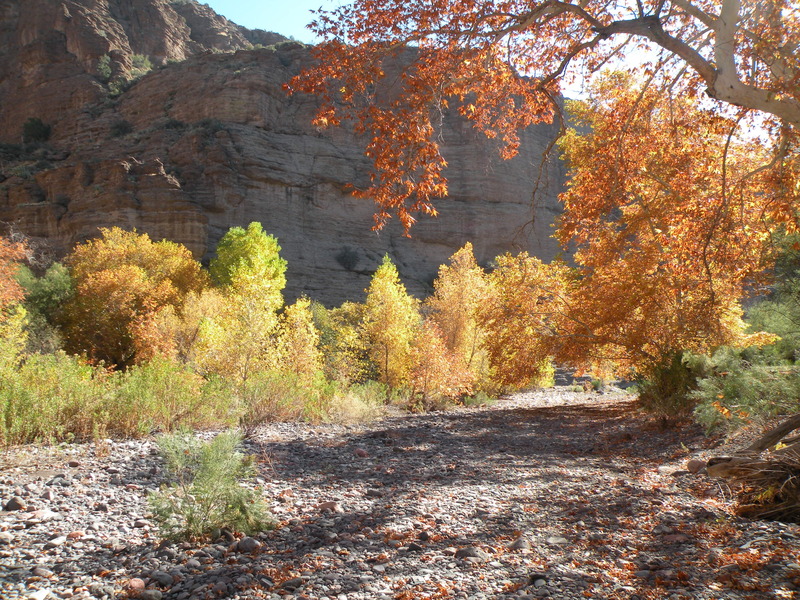 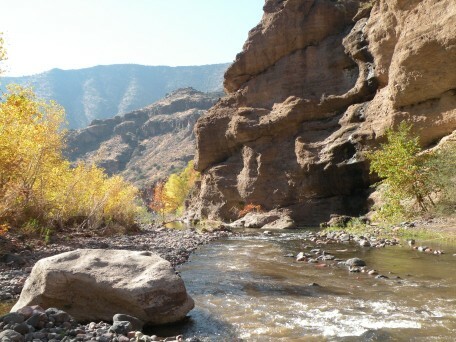 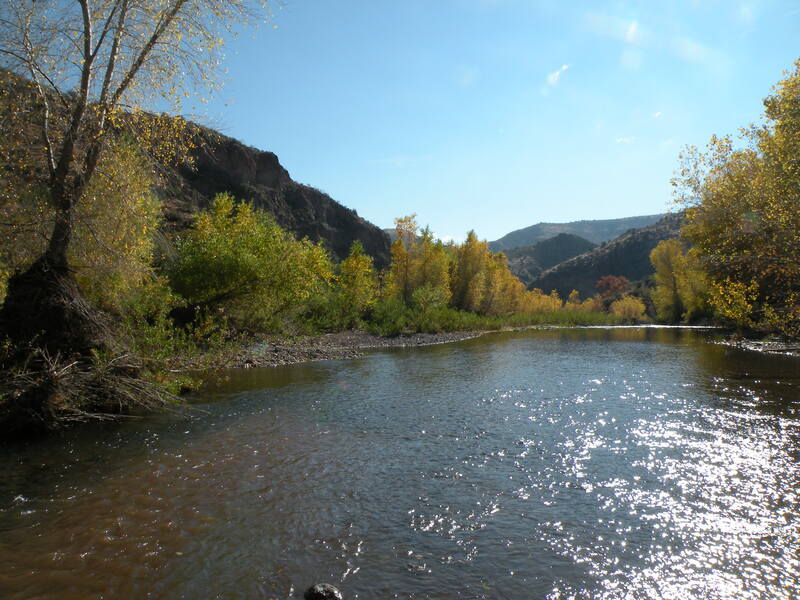 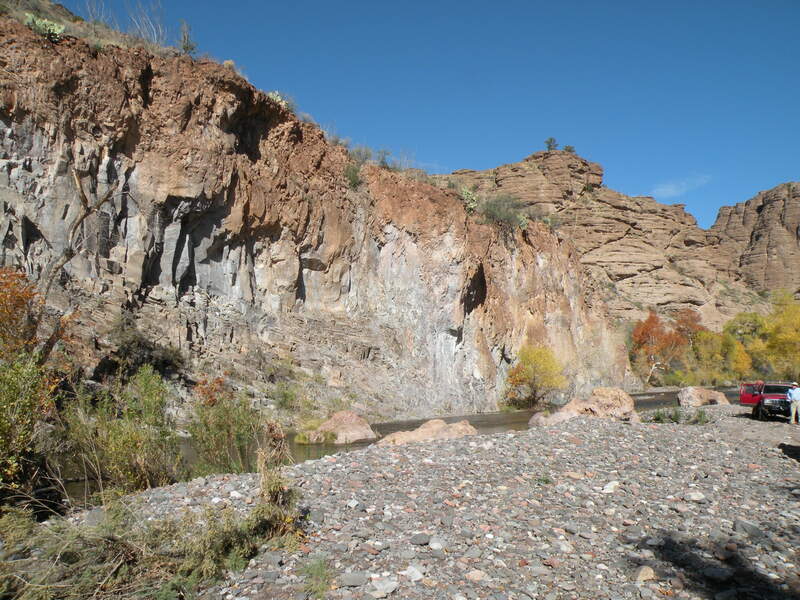 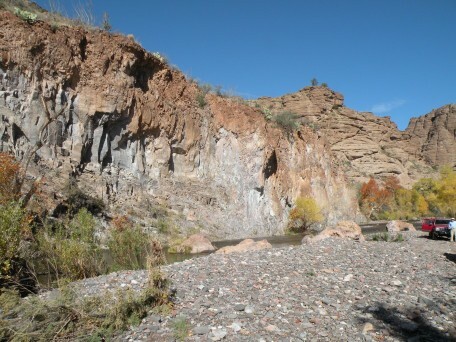 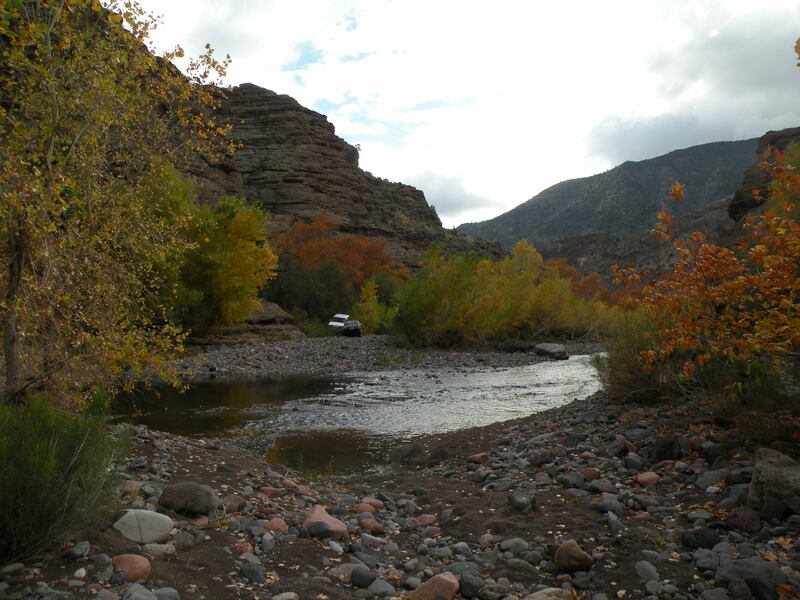 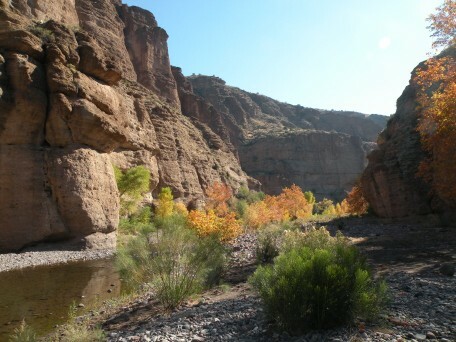 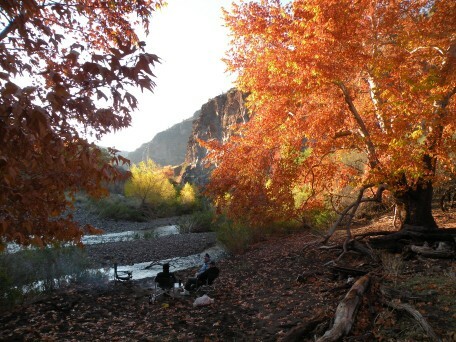 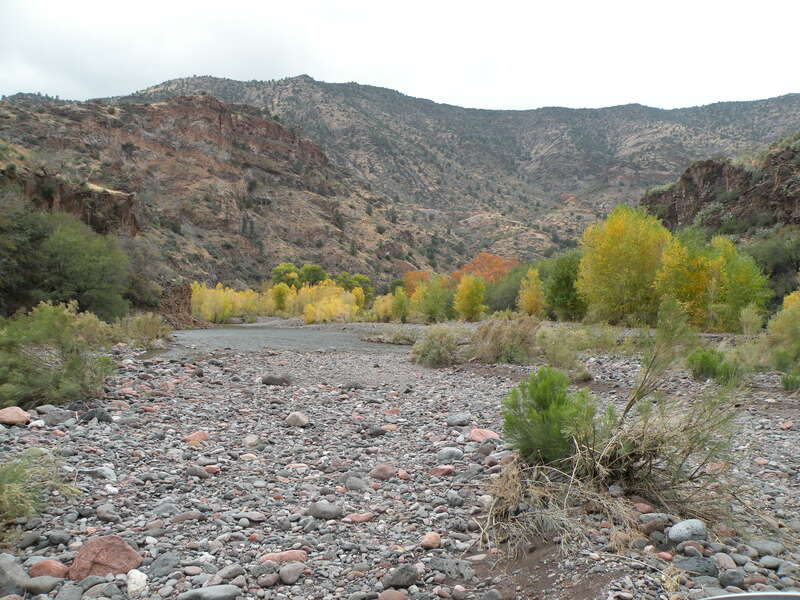 This trip differed from most trips to Lower Eagle Creek in that we turned upstream from the pumping station rather than our normal trip downstream trip toward the confluence with the Gila. 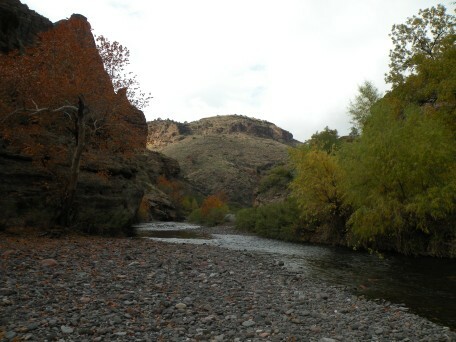 You start by crossing the creek at the pumping station and then heading up and around the hill to rejoin Eagle Creek above the reservoir for the pumping station. 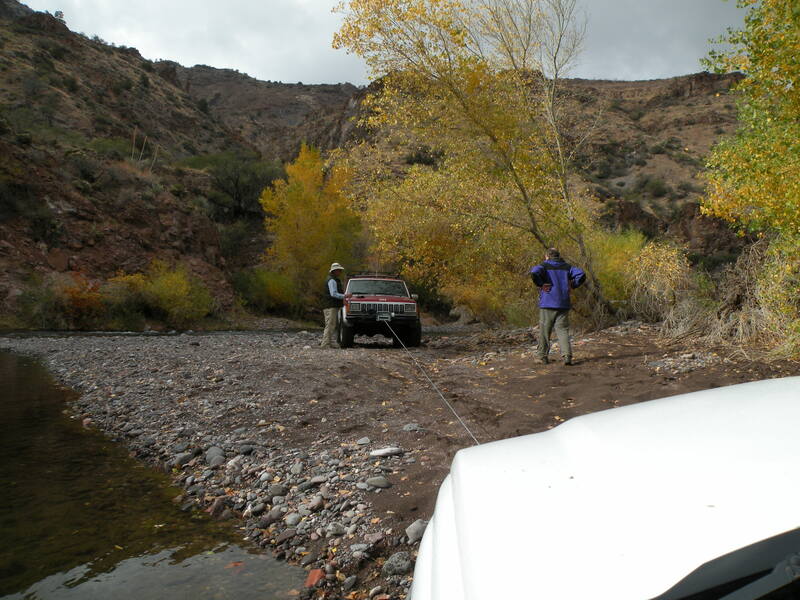 The Thankgiving rains had raised the flow in Eagle Creek up to 40 cfs, so we had more water on this run than would otherwise have been expected. 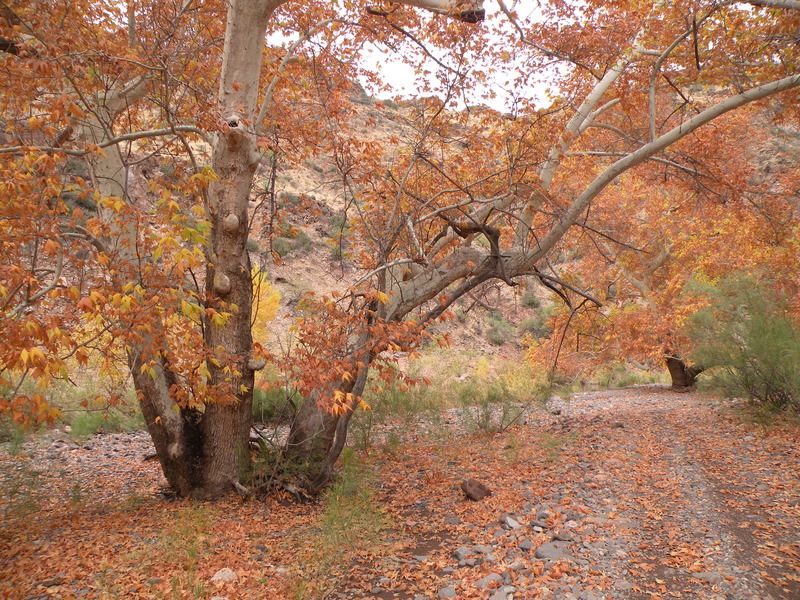 We also quickly discovered that the 2005/2006 floods had roughened this trail as well as the downstream section. Thus a run that previously would have been rated "3" was a fun "3.5" with water crossings up to 28-inches deep. 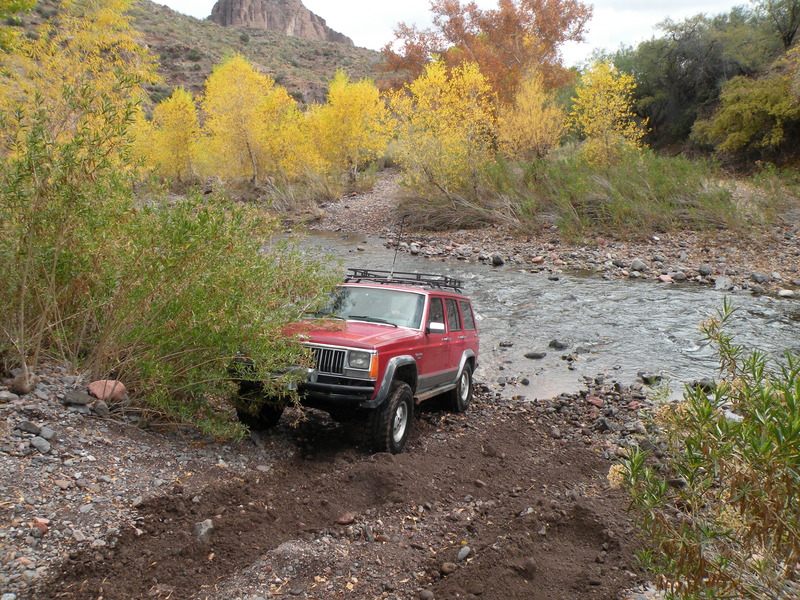 The first interesting event was that John tried to sneak across a sand bar at the edge of the creek and got stuck. 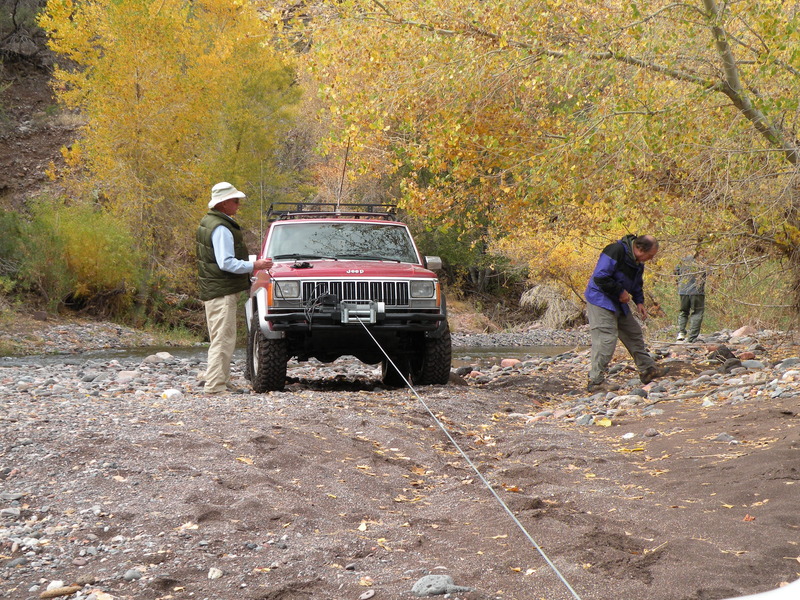 This made Mike very happy because he got to put his new winch into actual use to rescue someone else. 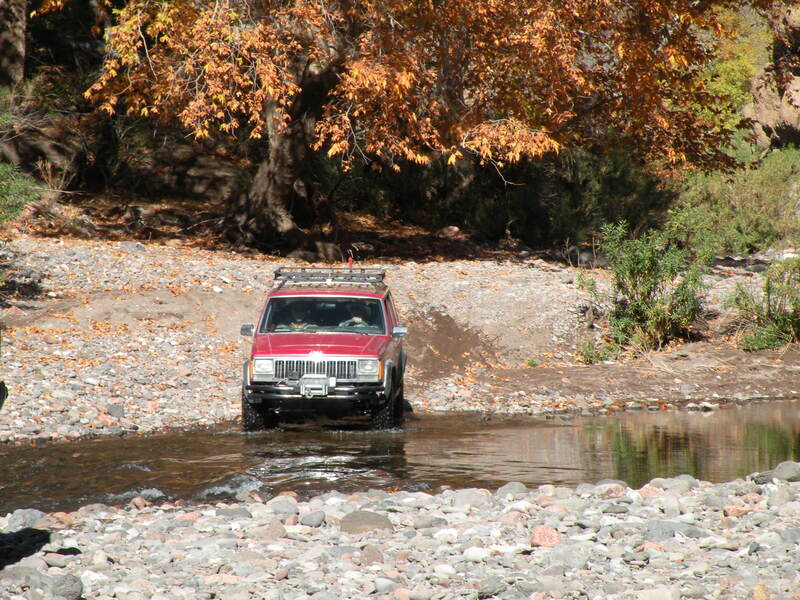 River running rule #1: always cross at the riffles, not on the bars. The yellow cottonwood and brown sycamore leaves always give Eagle Creek some spectacular fall colors around Thanksgiving, and we were not disappointed. 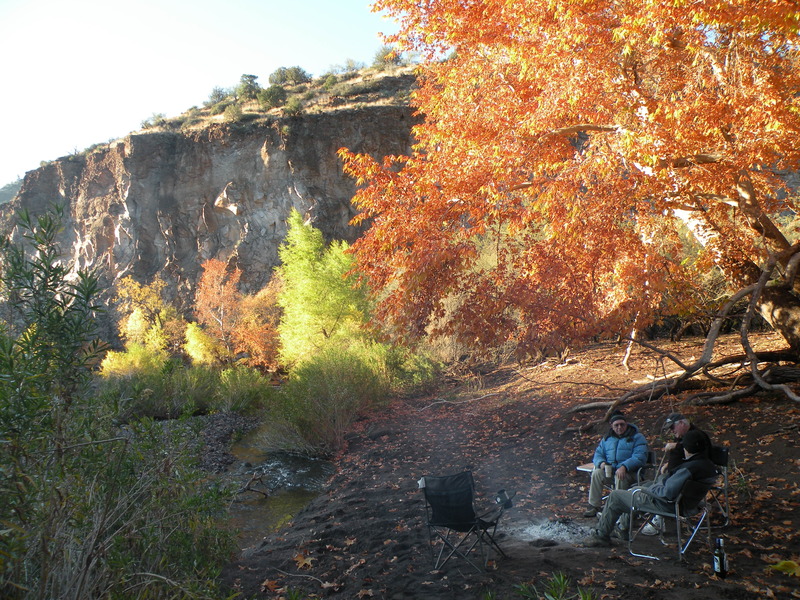 We went about 5 miles upstream before we picked a camping spot for the night. 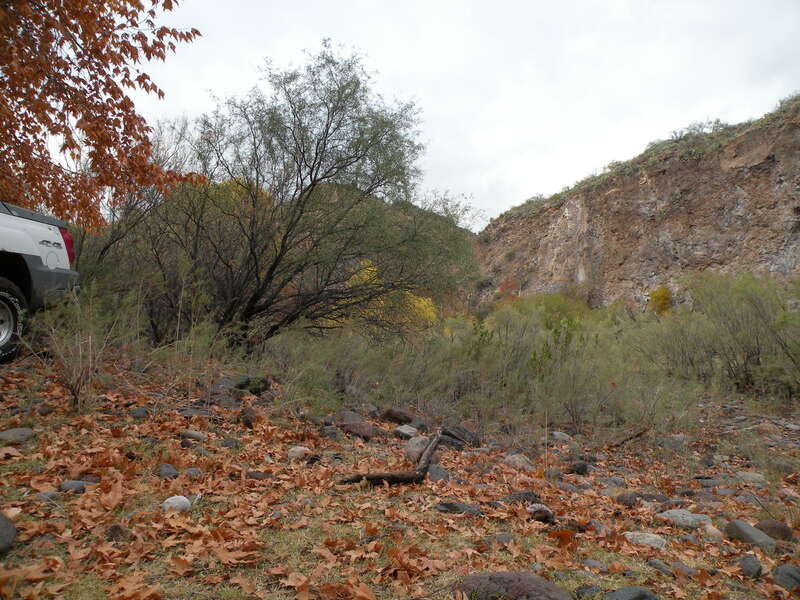 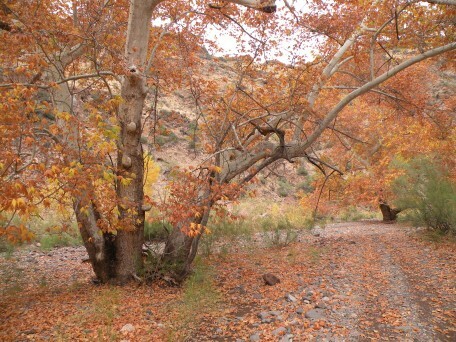 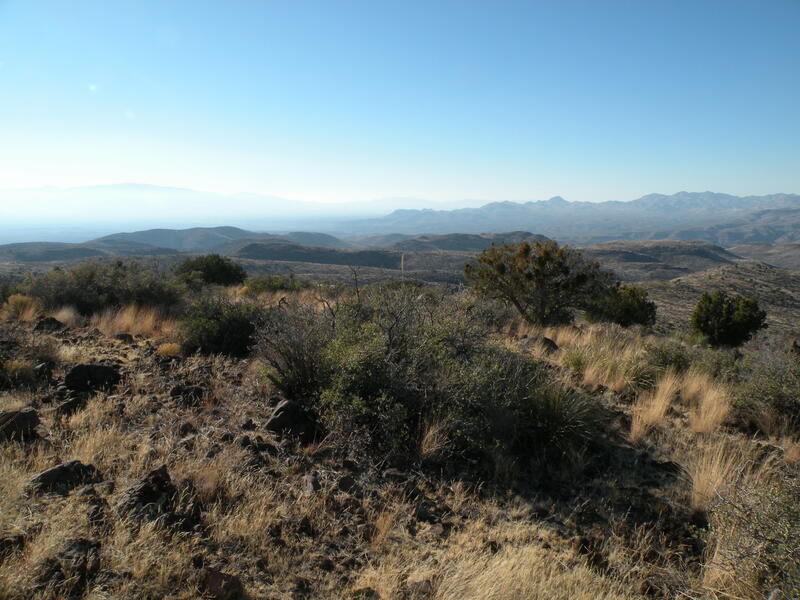 We are quite fuzzy (spoiled) in this sense: we must have some nice sycamore trees on a wide sand bank, plus a mesquite bosque nearby to supply firewood. The seasoned mesquite fire was quite enjoyable in the slightly damp weather. 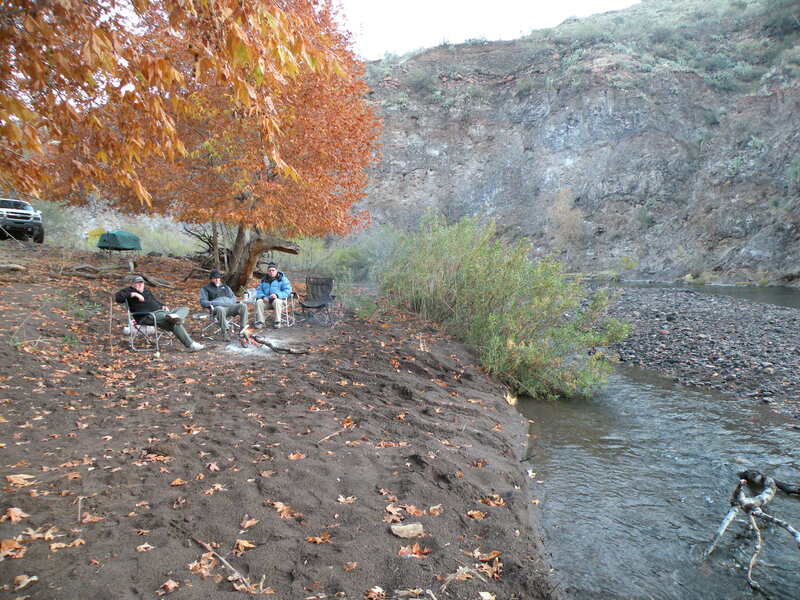 We didn't have any of the infamous Eagle Creek exploding rocks as our fire ring was pure sand. 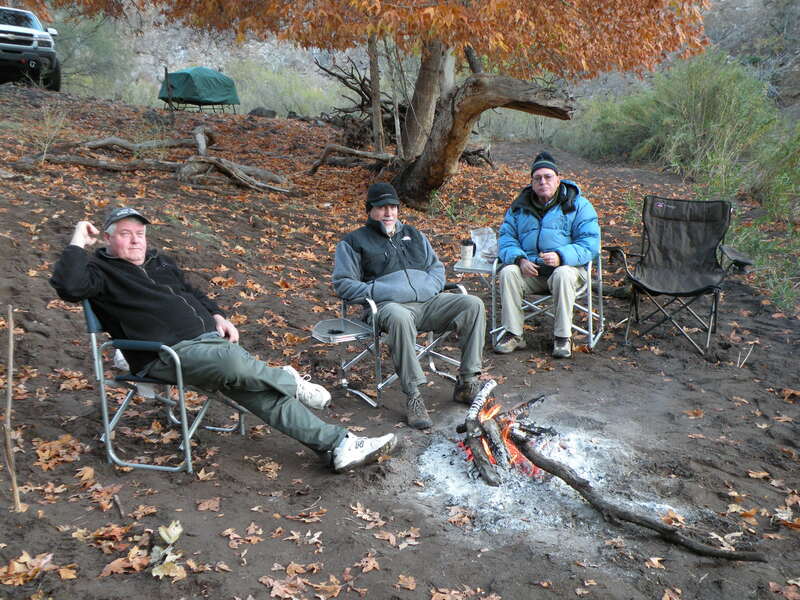 The sky cleared about an hour after sunset and we enjoyed watching the northern Milky Way set in the west. The temperature only dropped to 39 degF overnight, probably because of the steady breeze to keep things stirred up. 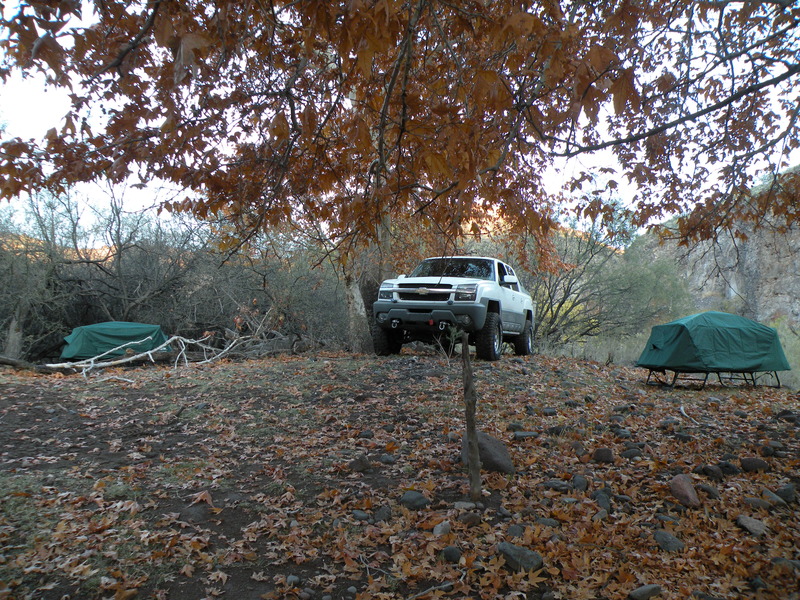 Our camping spot was just south of where Eagle Creek bends around to the West (running West-East rather than the typical North-South). The next morning we headed back downstream after a leisurely breakfast. The bright sunshine and deep blue sky made the scenery even better than the day before. 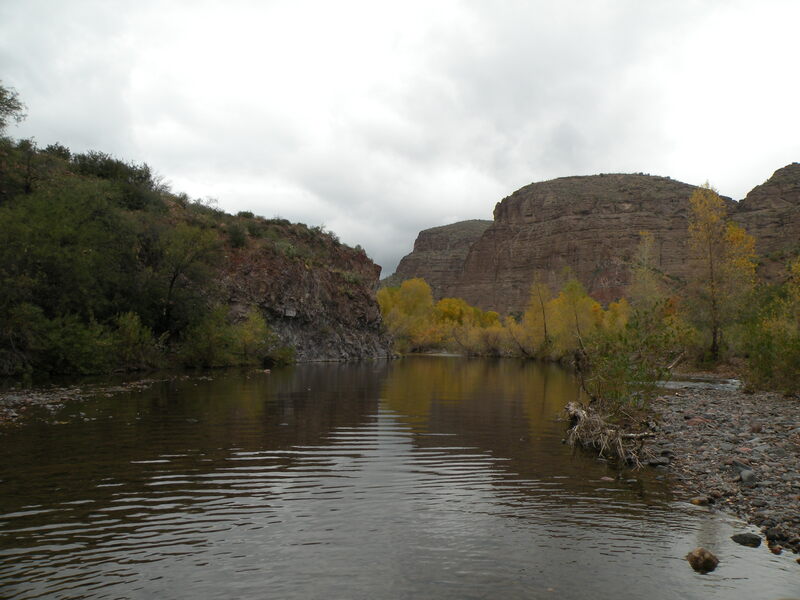 The cliffs on the upstream part of Lower Eagle are only slightly less impressive than the downstream part. 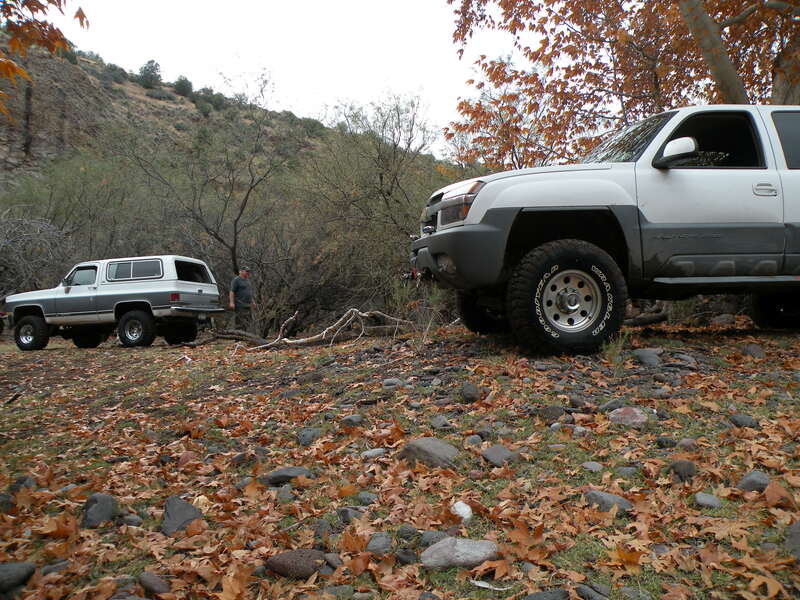 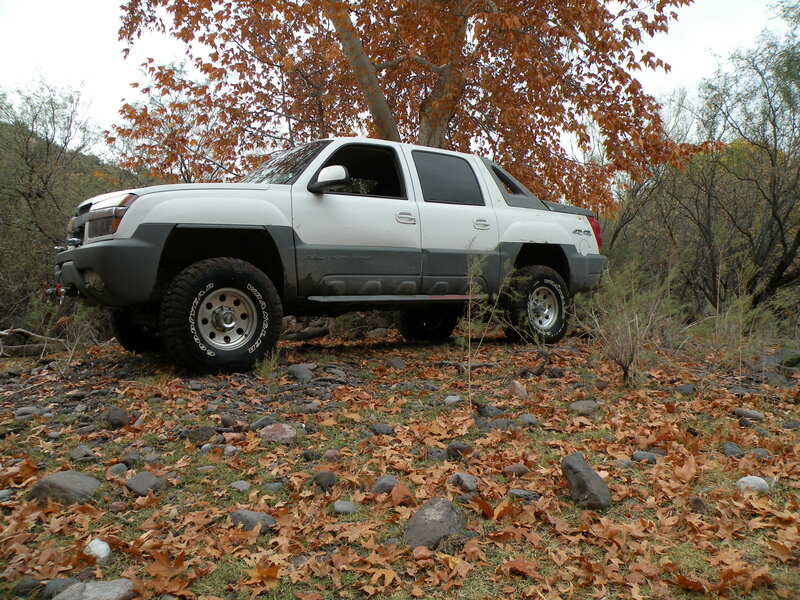 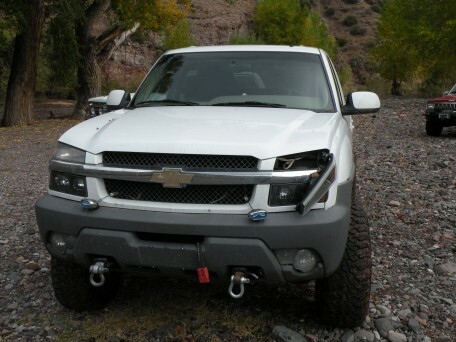 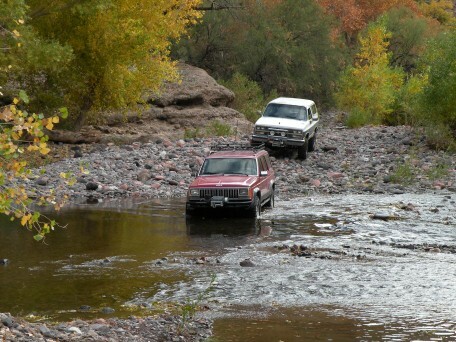 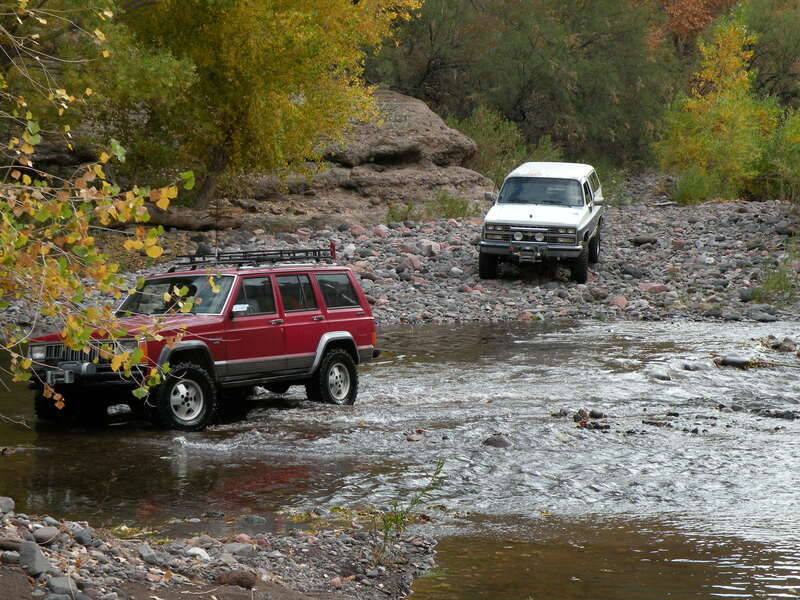 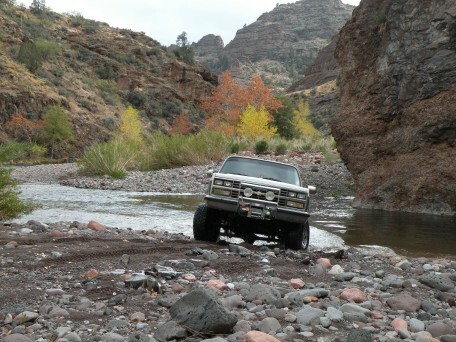 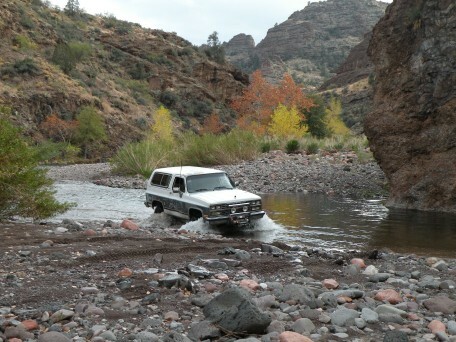 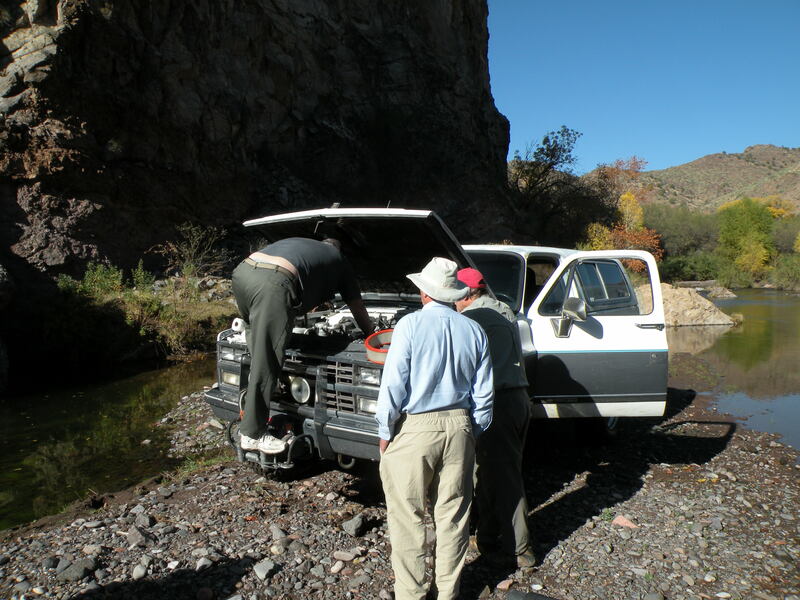 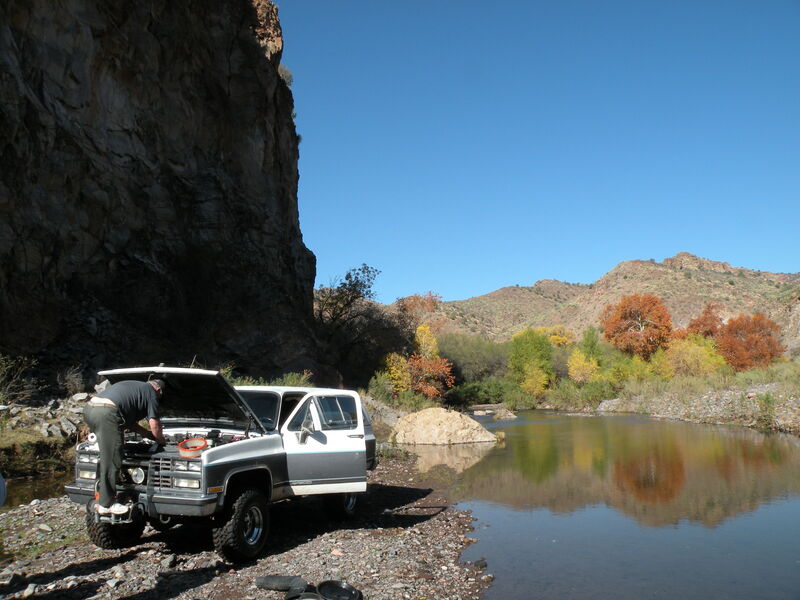 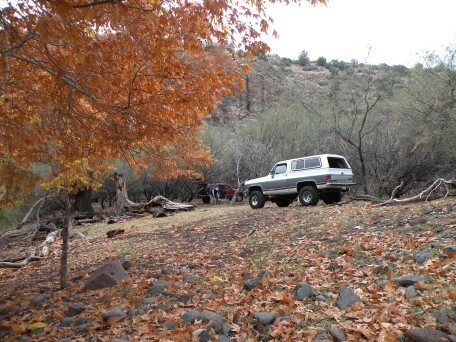 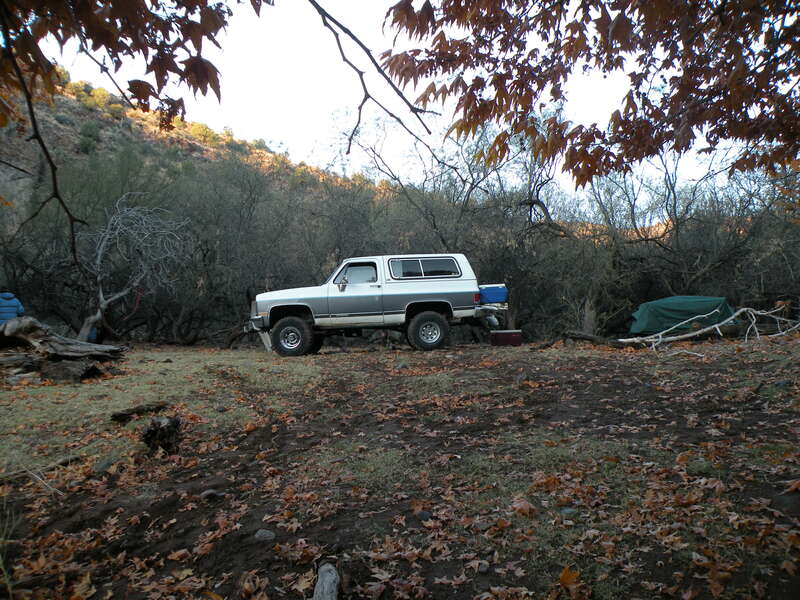 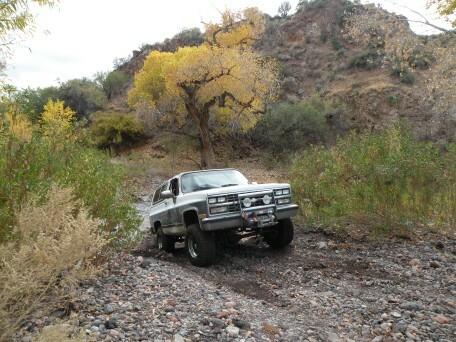 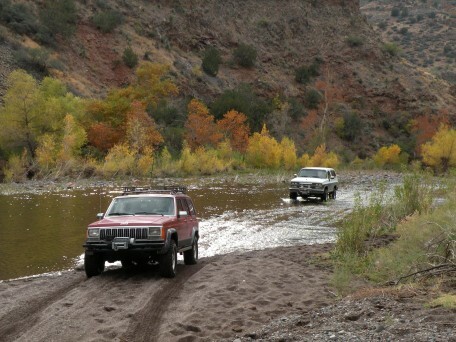 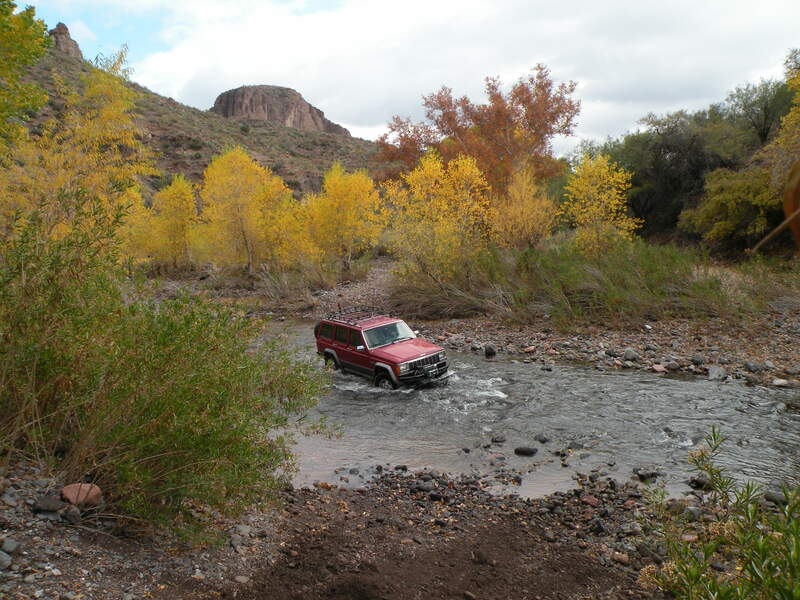 Bob provided another winching opportunity when he accidentally drove into a 45-inch deep hole and flooded his engine. River running rule #2: always cross at the riffles, not through scour holes next to large rocks. There wasn't much wildlife on this trip, but John saw a bald eagle, a heron and a couple of ducks. 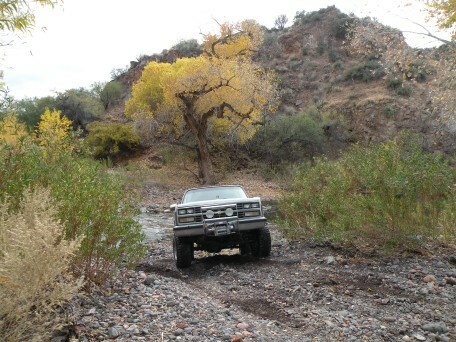 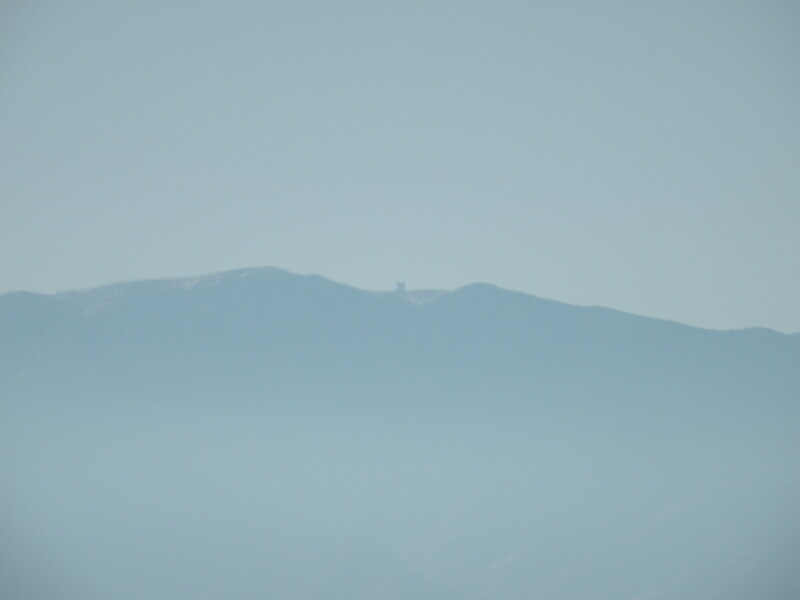 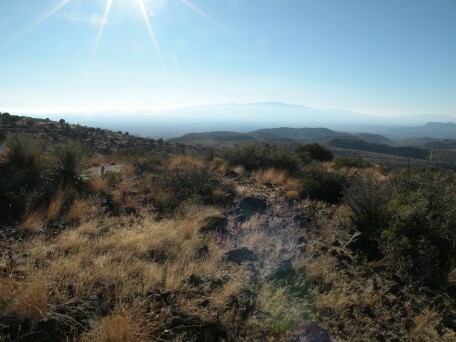 We got back to Morenci at about 1PM without further incident. 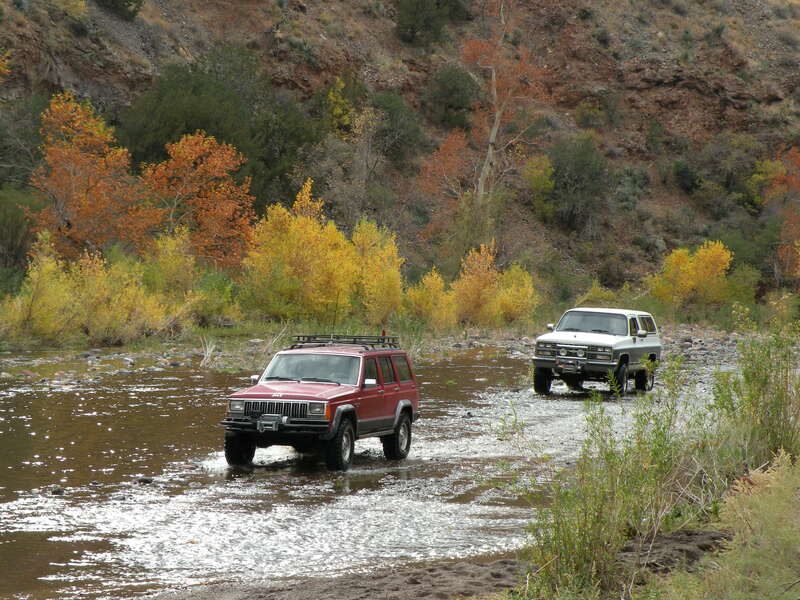 John, Mike and Rick went home via the Black Hills Back Country Byway to enjoy some more scenery. 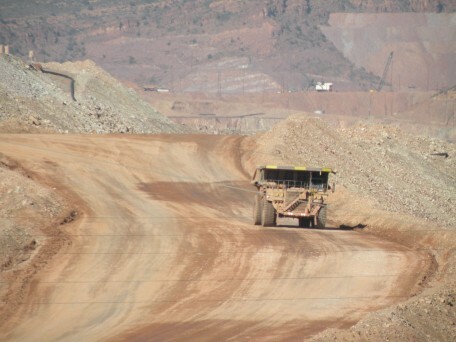 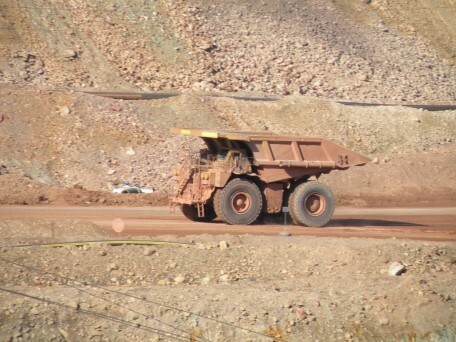 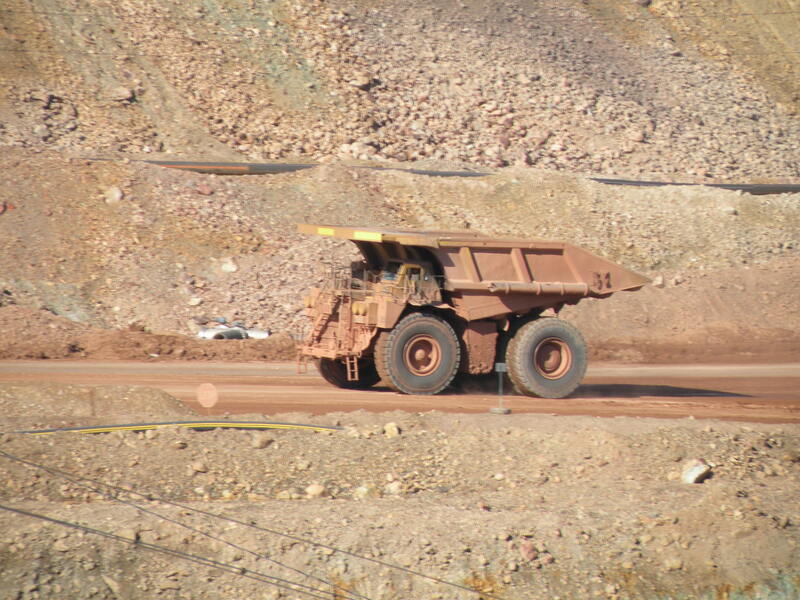 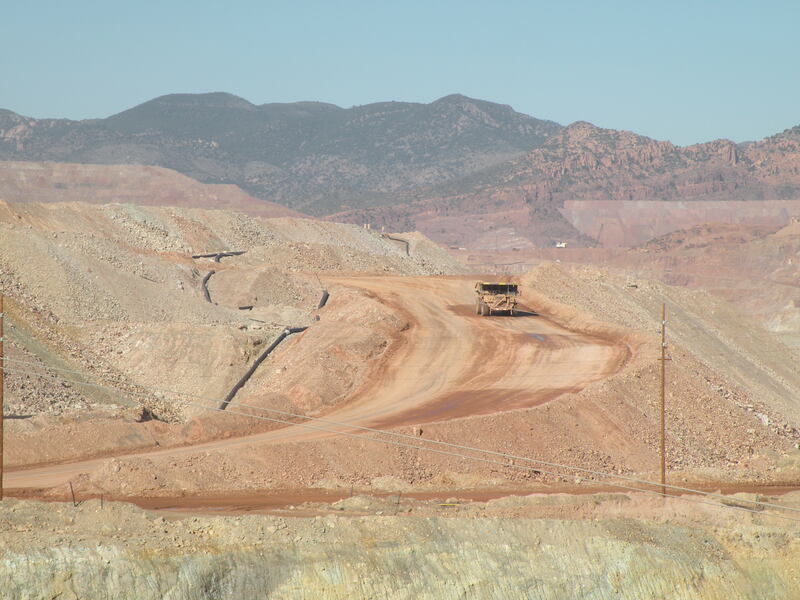 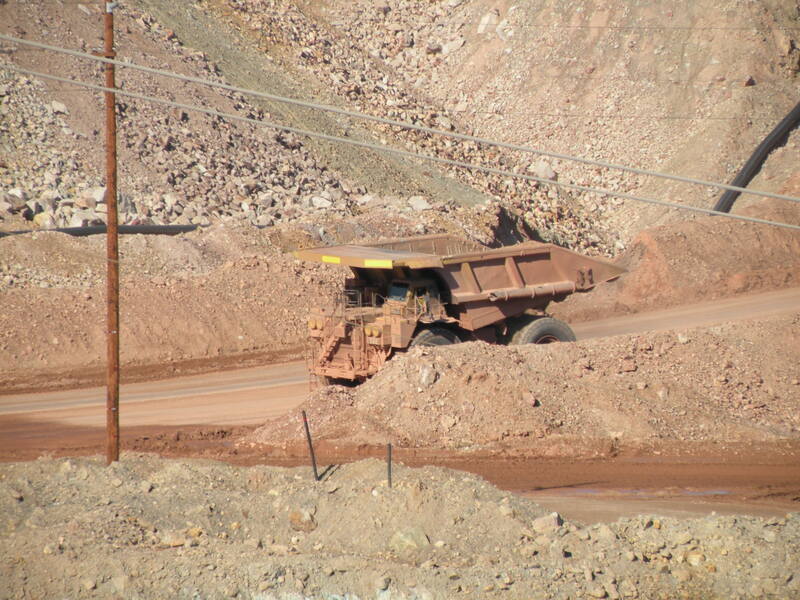 Trucks at the Morenci mine.